I'm trying to get this done or close to it by next weekend so I can take it to the engraving convention in Reno and find out if I'm doing this right. It's so weird. Looks great one way but in most lighting the image shows up negative and it looks like crap. Evidently that might just be the nature of the beast, so to speak. I can see why people ink them (this is NOT inked in the photograph, it's all in the lighting) but the purists say if it's good you don't have to ink it. Eh. I don't know. I have no idea why it turned out accurate color in the photo tonight, that was a fluke! Usually the fluorescent ring light on the scope makes the photos turn out a bit green. That looks outstanding, and in person I am sure it is even better. This would be fitting for a fine firearm, if you pursue that venue. I am sure the folks in reno will be able to offer many helpfull ideas, but to me, you got it. Thanks anonymous! (Are you an engraver?) I think knives will be more where I'm heading, as there are soooo many regulations and politics surrounding the custom firearms market. 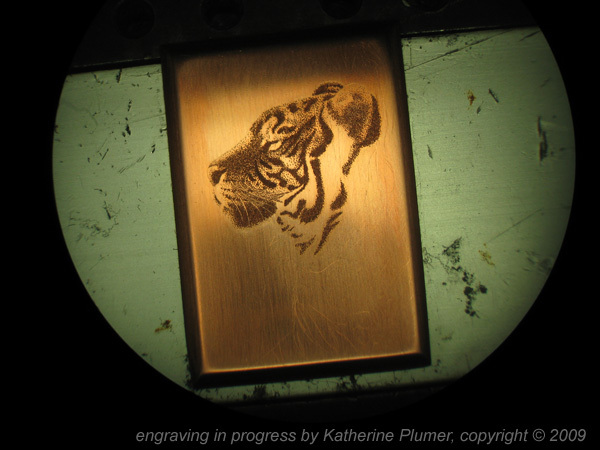 Yes I like to think I am an engraver, my animals would not come close to your first try. Mainly I do american scroll, like turn of the century cowboy guns. I heard that there will be a custom knife makers display at the FEGA show in reno. There used to be the blade show at the same hotel but I dont know if it will be there this year. I have been watching your work on the Lindsay site. Thank you for the tutorials. Yeah, the knife show that used to be at the same time as FEGA has moved. I forget where, but I think it's in August. There will be a knife display at FEGA itself, I'm very interested to see that. Are you going to be there?